You and your vehicle are always in good hands at McLeod's Body Shop. McLeod's Body Shop has been in business since 1981, and from that time we have learned a thing or two about vehicle repair service in Ashland KY. With our fully trained staff of professionals, we pride ourselves on being able to deliver award winning quality all while never losing focus on the big picture, getting you and your vehicle safely back on the road as quickly as possible. 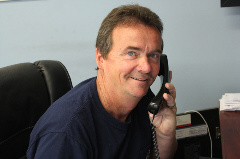 What makes McLeod's Body Shop different from the other auto body repair shops around is the people we surround ourselves with. Our focus is and will always be on you, the customer. The McLeod's Body Shop commitment to quality and service can be traced all the way back to our humble beginning, where our owner made it clear that our services were about helping people through tough times and not about large company politics. For added peace of mind once we have returned your vehicle back to its pre-accident condition, you can feel confident knowing that all McLeod's Body Shop work is backed by a written Lifetime Warranty. When it comes to your vehicle taking chances should never be an option. That is why here at McLeod's Body Shop we offer a lifetime warranty on our work to give you the peace of mind in knowing that the problem is taken care of and done right the first time. Here at McLeod's Body Shop you will be able to tell the difference in the way we do business from the moment you enter our shop. From our friendly team, all the way to our repair professionals, McLeod's Body Shop goes the extra step to ensure you are satisfied and receive a better vehicle repair service in Ashland KY. Contact us today and we would be happy to show you exactly what we are talking about!